7 versions of each map, 3 pre-colorized - one political and two vegetation & elevation physical maps - in addition to two base grayscale files, plus editable vector maps in Illustrator EPS. Easier-to-use closed and pre-filled Illustrator and Photoshop paths - editable and selectable layers. Over 16,000 updated place names and labeled physical features including rivers, lakes, cities, countries and mountains. their borders, highlight coastlines and add dramatic 3-D effects with land mass, coastal shadows or vignette masks. 7,500 map files with over 10 Gb of uncompressed files. 38 professionally animated globe sequences in QuickTime or Video for Windows - includes original 3D files and textures. 54 stunning, high-resolution globe views (15 of which are fully colorized) showing land relief with land/ocean masks. Between 100 and 1000 meters per pixel, 300 dpi resolution for high quality imagesetter output and 72 dpi for Web use. Reproduction rights granted with your purchase of MOUNTAIN HIGH MAPS® allow almost unlimited commercial use. MOUNTAIN HIGH MAPS® includes all the FRONTIERS Illustrator / FreeHand vector maps described below. MOUNTAIN HIGH MAPS® - CONTINENTAL EDITIONS - Version 4.0 The unique MOUNTAIN HIGH MAPS® collection of relief maps is available as separate products for the designer who only requires a smaller selected group of Continental maps or World / Globe Views for Mac or Windows. The map specifications are identical as for the full Mountain High Maps Edition, including both bitmap JPEG and TIFF Photoshop images along with vector EPS and FreeHand files. All products include the Frontiers vector and paths material. MOUNTAIN HIGH MAP FRONTIERS Version 4.0 is a collection of high quality editable outline maps. This superb resource of 78 map views covers the world and consists of coastline, borders, rivers, city locations and longitude/latitude graticules to fit the MOUNTAIN HIGH MAPS® relief map images or can be used independently as a self-contained resource. Each map is available in three formats: Adobe Illustrator (EPS) AI 7 and CS 2, Photoshop Paths. Rights allow almost unlimited commercial use. ITEM 1023 Complete Collection: $39 - Individual maps for download $9. Complete collection of 50 states on Flash Drive ITEM 0762 Price $190. The Eastern USA collection 30 states on Flash Drive ITEM 0779 Price $95. The Western USA collection 20 states on Flash Drive ITEM 0786 Price $95. Collection of 50 EPS states by immediate download ITEM 0809 Price $49. GLOBESHOTS® is a distinctive collection of high quality relief globe images with enhanced 3D effect. This superb resource of 100 high resolution (300 dpi) TIFF RGB and 164 low resolution (72 dpi) PICT/BMP colorized globes show the world in 5 general categories and 39 specific viewpoints - equatorial, polar, strategic, oceanic and continental. The Relief Globes are presented in a range of styles and colors, with and without cloud cover, with masks and artwork to reconfigure the globes with interchangeable foregrounds and backgrounds, including blends, halo and star effects. Masks are provided to remove the globes from their background and provide shading effects. To view the complete catalog of globes and review product information and licensing details see www.globe-world.com GLOBESHOTS® Complete collection or individual globes for immediate download - Mac/Win ITEM 0076 - $19 or $9 per individaul globe. EARTHSHOTS® is a distinctive library of full color World relief maps of our planet's continents and ocean floors. 250 world view variations featuring political and topographical themes including, climate, vegetation, living standards and population. EARTHSHOTS is suitable for paper or electronic media publishing applications, print, multimedia, broadcast and DTP map graphics. The image library is JPEG format, 14 Mb decompressed and 300 dpi. MOUNTAIN HIGH WEB MAPS is a unique collection of relief images of the world, continents, countries, and ocean floors. Each dimension and contour of our splendid planet is portrayed in a detailed and accurate topographical relief view. These images can be used to lend a fascinating realism to your web or multimedia projects, and help you to get your message across, navigate your web site, or simply show your clients your areas of interest or operation. Many successful titles featuring MOUNTAIN HIGH WEB MAPS include Where in the World is Carmen Sandiego, Tom Clancy SSN, CNN Time Capsule, AccuWeather and WeatherLabs, Arab Net, Intelsat, The Oregon Trail, Corbus Volcanoes, Quokka Sports and Wired. All images are 72 dpi, JPEG, and supplied with a full set of masks that allow customization by enabling the features of the full Mountain High Maps collection at a low resolution and at a competitive price. MHM ANIMATIONS Colorized globes are presented in a variety of animations, showing revolving globes, fly-pasts and other sequences using QuickTime for Macintosh, QuickTime .MOV files and .AVI Video for Windows files. The collection features 38 animated globes with a variety of frames per second and view screen size in pixels, time of sequence in seconds, file size in megabytes, and color and style variations. POWERPOINT MAPS Digital Wisdom’s collection of Mountain High Maps for PowerPoint® Presentations is available for immediate download. 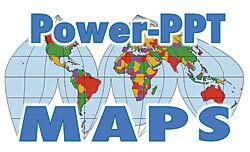 Each set of maps is delivered as a Microsoft PowerPoint® PPT format file and can be easily and speedily edited within PowerPoint® application to create a map with a wide number of impressive variations to meet your presentation needs. Options are available for individual PPT maps, elevation relief, vegetation relief and political color fill versions, or a bundle of all three versions. Go to Map Catalog to view download options. 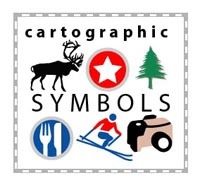 MAP SYMBOLS The Digital Wisdom cartographic symbol library provide graphic artists and mapmakers with a complete, well-designed contemporary set of map symbols packaged into an Illustrator vector library covering most of the features that need symbolizing on a map. Each library contains point, line and area symbols (including colors and patterns) which are fully editable and scalable. The design of each and every symbol has been very carefully thought through to allow intuitive recognition of the main features of a map and use a minimal footprint to cut down on map clutter. These beautifully designed point, line and area symbols and color sets for Illustrator are compatible with their earlier versions wherever possible, but also recognizing that a higher level of cartographic presentation, quality and efficiency possible with Illustrator 10 should be a key feature. This allows the definition of points and symbols to a higher level, depicting the purpose and function of a wide range of activities, specifically geared towards tourism, travel, orientation, navigation and entertainment. ANTIQUE MAPS OF THE WORLD is a comprehensive five CD-ROM library of images which encapsulate the discoveries of five centuries of antique maps, celestial charts and illustrations, cartographic motifs and more. With these stunning antique art maps, designers, artists, publishers, and graphics professionals can use history's best visual communications to convey a message today. See www.antique-map.net for more details. FLAGS OF THE WORLD - Professional Quality Postscript National Flags contains over 375 editable full color EPS international flags representing countries and organizations, including Historic flags, old flag versions, Naval flags, Warning flags, International Numeral & Alphabet flags. Flags are high quality with the very latest national flag changes plus optional emblems - see www.world-flags.net for a complete list of the flags and a downloadable view catalog. This product is also available for immediate download. US STATE FLAGS - US State Flags is an Encapsulated Postscript (EPS) collection of 50 full-color US State flags representing states throughout the US. US State Flags collection also contains additional flags, including 35 Current and Historical USA flags, and 7 District and Territory Flags. Each flag is full color and drawn to the highest detail to insure superior reproduction quality at large or small sizes. For full details see www.state-flags.us. Macintosh and Windows files are provided in EPS format. Product is available for immediate download.